"Who Was Essad Bey?" is the title of a concept album by the Berlin-based three-piece The Disorientalists, aka the Essad Bey City Rollers, released at the tail end of 2016 on Oriente Records. This truly unique work in progress features Yuriy Gurzhy (RotFront, Russendisko, Born in UA), whom you may remember from the "High Words" remix, Daniel Kahn (Daniel Kahn and The Painted Bird, Brothers Nazaroff, Semer Ensemble) and last but not least, Marina Frenk (Marina & Kapelsky, Real Baba Dunyah). Hailing from the Ukraine, the US and Moldova respectively, the three joined forces in their new home of Berlin a while back and eventually decided to write and occasionally perform a 'musical', telling the life story of the late, enigmatic Essad Bey, aka Kurban Said, aka Lev Nussimbaum, who is coincidentally also considered "one of the most exotic German writers of the early 20th century." And what a story it is: "Born into a Jewish family in Kiev in 1905 and raised in Baku, Lev emigrated to Berlin after the Bolshevik revolution. Fascinated by oriental culture and life, he soon converted to Islam. In fact, one of the reasons for Essad Bey’s success was that he wrote about things he knew well and which seemed extremely exotic and exciting to the German audience, i.e. Islam, oriental culture, or his life in the revolutionary Russian empire. Another factor for Nussimbaum’s success was his very appearance. Essad Bey went on to cast himself in the image of a true Persian prince and played this role throughout his Berlin days. Such an image also attracted Essad Bey’s wife, Erika Loewendahl, who later expressed her disappointment by saying that she believed her husband was an oriental prince, only for him to have turned out to be just another Nussimbaum. There was, however, one more, post-Berlin, part to Essad Bey’s story. In the 1930s the writer left for Italy, where he became an avid fan of Mussolini and even aimed to become his biographer." Although his life was cut short at the age of 37 by a rare blood disorder, Essad Bey's veiled persona, with a little help from The Disorientalists, continues to intrigue and fascinate audiences to this day. Even more so, seeing as many of his supposed feats might really be fake. "Essad Bey was also known as a great mystifier. It turns out that a number of books he claimed to have written, later appeared to a have a different authorship, while many facts and details from his own works no longer seem entirely trustworthy either." That being said, The Disorientalists continue to seek out new truths on Nussimbaum, as they musically retrace this no doubt legendary figure's footsteps. Call it klezmer cabaret, oriental ragtime or historic theatre, you can listen to the album sampler in the SoundCloud player above, or watch this paparazzi-style footage from an early performance at the Berlin Gorki Theatre's Studio Я in the video below. "Well, who WAS Essad Bey? 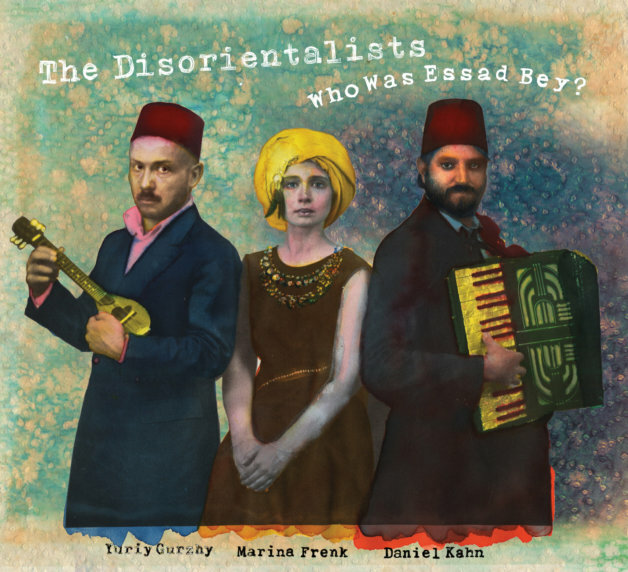 See The Disorientalists perform "Who Was Essad Bey?" live at P.A.N.D.A Theater in Berlin next Saturday, December 15th, 2018! Get your tickets here. This will be their only performance of 2018 so be quick.